Two dispatchers with the California Highway Patrol initially dismissed 911 calls that came in reporting a fire on the south rim of Lake Tahoe, causing a seven-to-nine minute delay in their response, recordings of the 911 calls that were released Friday show. On the tape from five calls answered by the CHP Truckee field office, dispatchers tell callers the smoke they are seeing is from a controlled burn in the area. The smoke actually came from a fire that ultimately destroyed 254 homes and burned 3,100 acres of mountain wilderness. "I'm on the golf course, it's — uh — Lake Tahoe Country Club, and we can see smoke coming off the mountain to the west of us," a man reported, according to a transcript of the first call received by the CHP's Truckee communications center at 2:02 p.m. on June 24. "Yeah. Yeah, they're doing a — a control burn there," the dispatcher responded. "Thank you," the unidentified male caller responded. "Sorry to bother you." Capt. Gary Ross, commander of the CHP field office in Truckee, said their dismissals caused a delayed response to the fire. The dispatchers also did not follow CHP policy, in which they are instructed to keep callers on the line and transfer them to a local fire department in such situations. Instead, they let the callers hang up. Both dispatchers have been reassigned while the CHP investigates, Ross said. "We have policies in place to make sure these type of things don't happen," he said. The CHP said it will not release the names of the dispatchers. One is a 27-year CHP veteran and the other has been a dispatcher for 17 years, Ross said. The Angora fire started June 24 after an illegal campfire was built about a quarter mile south of Seneca Pond, a popular recreation area south of Lake Tahoe. An army of firefighters descended on Tahoe, containing the blaze on July 2. 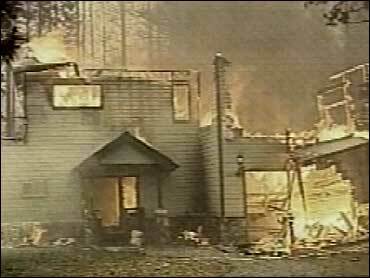 The cost of suppressing the fire was $12.1 million. Assemblyman Ted Gaines, R-Granite Bay, said the delay shows that California's 911 system should be modified to route calls directly to county emergency responders. "I'm shocked there would be that much of a delay before it got to the fire department," said Gaines, who spent Friday touring the charred forest. "People's homes could have been saved or at least some of their personal possessions and pets." South Lake Tahoe Mayor Kathay Lovell said she also would push for changes to California's 911 system to prevent such communication delays. Homeowner Tony Colombo, 52, who lost his home in the fire, said he didn't want to "play the blame game" but added, "I find it disgusting, because we knew this basin was a tinderbox." "There were people who dropped the ball in the jobs," he added. A spokeswoman for Gov. Arnold Schwarzenegger said the governor was concerned. "We take this matter very seriously," said spokeswoman Sabrina Lockhart. "We are awaiting the outcome of the CHP investigation." The 911 calls first came from golfers at a course at the base of a hill within three miles of where the fire began. Within 10 minutes, people as far as 10 miles away near the base of the gondola at Heavenly Ski Resort could see the smoke, according to the recording. At first dispatchers were dismissive, telling at least five callers that the smoke was from a controlled burn — a purposely set fire which is often used to clear forests. But there were no controlled burns scheduled in the area then, said Jeff Michael, chief of the Lake Valley Fire Protection District. Michael said there had been no controlled burns allowed for a week before the start of the Angora fire because of the unusually dry conditions. "There's no way in heck we'd let people burn on that day. It was too dangerous a situation," he said. As additional calls came in to dispatchers on the afternoon the fire began, they became less sure about the existence of a controlled burn. "Yeah, we've got a bunch of reports on it," a dispatcher told a female caller at 2:12 p.m.
"Do you know what the story is with that? I live over there," the caller responded. "Oh, you — well, I'm not sure," the dispatcher answered. "Yeah, I'm trying to get through to fire to verify if it's a control burn or not." Eight minutes later, another caller described seeing flames from the golf course. "Yes, we've got a number of calls from everybody on every fairway," the dispatcher responded.